So, Julie Chen went to Twitter tonight and sent out the picture seen below and said a new twist is coming tonight on Big Brother 2014! What do you think that twist will be??? Big Brother 16 starts in about an hour and I am dying to know. Check out the photo below in our Big Brother 2014 spoilers! 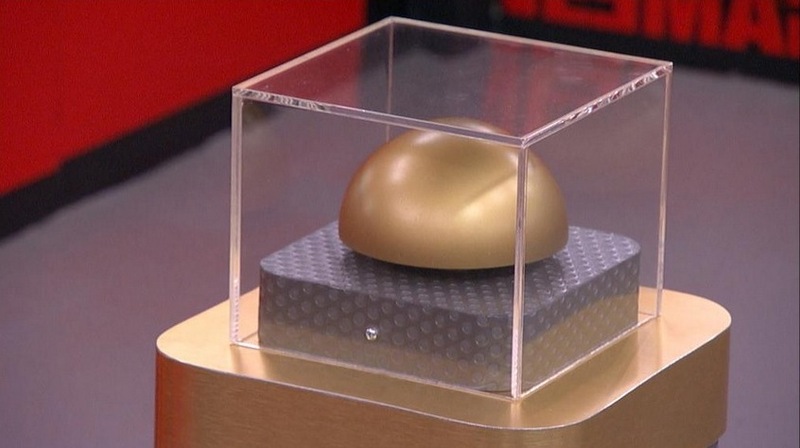 Hmmm…could it be a “Reset Button” like they had in BB14 and the evictee that night (Frank) was saved! Could it be a repeat of the that button and everything goes back to normal? Maybe they think Frankie will go in the second vote and they want him saved? If so, they should call it the Frank Button! It could be some type of Veto power to go with tonight’s double eviction? Or maybe it will open Pandora’s Box? Is it 9pm yet???? ***UPDATE: During the live show tonight, Julie Chen told us this button is “Big Brother Rewind” and if any HG hits it over the next few days, then this whole upcoming week is null and void! It will be announced right before the live vote if it was hit and the two nominees come off the block and they redo the entire week! Not sure who can or cannot hit the button and how they would hide it from the others? It is currently in the old Have Not room. If it is hit, do they redo the entire week during the live show??? Whatever it is, I hate to say, I refuse to get my hopes up. Been let down too many times by this show. On the wall behind the button box is a word. What do you think it says? Wth, Cat? I can’t see it. It’s written in red but i can’t see the whole word. …MA….? Focus behind the box…more on the right. Man, you’re good. All I can make out is an M. Maybe my ipad isn’t showing me the full photo…? I can’t see it. I even enlarged the picture but then it was too blurry. It says GAME it has it frontward and backwards all over the wall? If the push the button the game rewinds and if you are on the block you can come off and the game starts over. Maybe a big O and then M and A. Is he still around? I saw him perform years ago – what an outstanding man. i see what you’re talking about, but i can’t make it out…something with the lettrrs M and A??? …buy when i first saw it, that’s what it looked like. I saw that. If you enlarge the pic it almost looks like HAIR!! wth?? I think it was supposed to be Frankie’s pink mohawk, so a save Frankie button! Well, it is my boss! He hates Frankie as much as we all do, but it was his sick sense of humor lol. I giggled when I saw it! I just want to know! if that is true, my tv will have one large bullet hole in it. Okay, LOL for real! Thanks for the belly laugh, Lobsta-man!! For the love of God, I hope not. I have an imagination. Thanks for the vote of “amazing twist”. BTW, they could fill in time by playing clips of them being real jerks. Entertainment ..no? I think it looks like a bean. LOL. A helmet?Maybe they need to wear it and b u t t heads? Maybe it’s a bell, not a button? I actually do think it looks more like a bell. Represents someone’s a dig-a-ling. None of them guys have a ding a ling! Man oh man I would just love to see him go! Hey, I know this is a longshot, but is there any chance that is the word backwards, or a reflection? Because A and M are the same both ways…. Yea, but what if they just confuse things by flipping the photo? Agree. I’m not only sick of a boring summer, I’m even sicker at having my chain constantly yanked. If this turns out to be some lame twist i’m going to scream! Their track record this year is horrible in the twist category. I might forgive them for screwing up this season if they give us something worthwhile tonight. Not holding my breath though. I was going to say something similar, I am tired or stupid twists that they hype up…..if it is something stupid then they are just trying to get ratings and couldn’t come up with anything else. I said the SAME thing to my husband. They are batting 100% failure in the “twist” department this season. I’m not hopeful…. I’m still thinking that whatever it is, it won’t save Nicole. Or bring someone back. I’d settle for shaking up those left a bit though. Yea. And as much as I love Nicole, she doesn’t have any fire left in her. I’m hoping it’s a reworking of Pandoras Box. Pandoras Button?? Wuss Mode Cowboy would have to be the one to hit the button. And if there is money involved…he’ll do it. They really do need to do something BIG! And know!!!! 1 – It opens Pandora’s Box and Frankie is replaced by Donny. 2 – They seem to be into Volunteering this season, maybe if you press the button, you will be evicted but get $10,000….You are volunteering to be evicted with $$$…. I don’t think Caleb would take that, though. His ego believes he’s gonna win this. What if they gave ALL of them a button and they choose whether or not to push it to receive a prize or a punishment. The 2 punishments would be that 2 of them go on the block….no nominations made. Everyone else gets a prize (whatever the heck that would mean). Someone else mentioned the changes to the Have Not room last night! Remember, it was sealed and could have to do with that! Pandoras Box. That has to be it. But i just don’t see how they would work that into a DE show. I’m thinking it must be something simple and they can do fast. Draw chips and they all get the option? Anyone remember the “pressure cooker” comp? They stood in a glass box with their finger on a button. Last to let go won HOH. Just a guess. I spit out my cheerios, Mary!! Lol! Well..well..well..Ariana Grande just sang the National Anthem for the Packers- Seahawks game. Hmmm..
Just saw that, she cannot sing for crap. Maybe she can get attention by learning from Molly Cyrus. To a degree, the Patriots are my home team, so I support them. I guess I just love being hated. Such is life. Friendly rivals, then!!! Go PACK!! Thank you for that..I thought maybe it was just me…She recently sang on America’s Got Talent…I did not understand one word she said. To the live recap now….let’s hope for the best with this twist! Chat room is open if anyone is interested. I don’t know how to join! Go up to the top of this page and click on chat. Under the BBB logo. Then you will have to register. From hear on out it should get good. They have to start fighting because they all can’t get to the finals. I can not wait to see Frankies face when he is evicted. You’re assuming he will be. I sure hope so!! I can not wait to see that happen. It will make my day when he walks out the door. What scares me is that I really think they have waited to long to put him up. They have had there chance and now I think it is to late. I hope not but unless somebody grows a pair it’s not gonna happen. And now Frankie is more determined than ever to win everything. Cody and Caleb are the only 2 that can stop him at this point.